Greetings from the momentarily sunny Seattle, in the Evergreen state of Washington, USA. We here at Tattva’s are delighted to introduce you to the yummiest coffee substitute this side of the Cascades, and certainly beyond. Capomo, or the Maya Nut, is the fruiting seed of Brosimum alicastrum, a giant tree in the fig family. 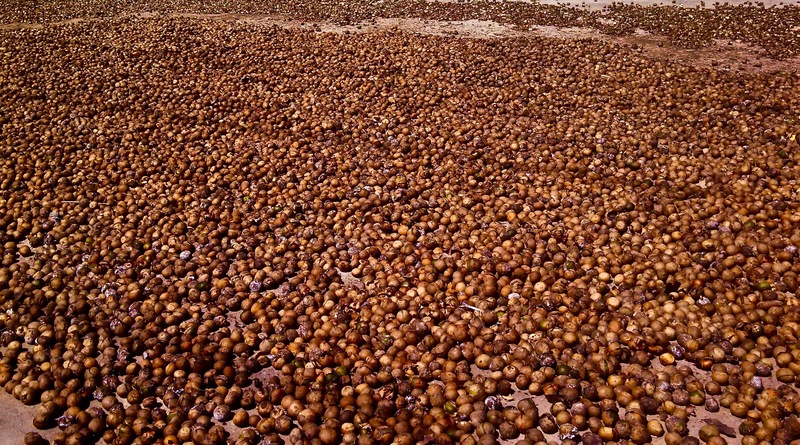 Indigenous to tropical rain forest from Mexico to Brazil, including the Caribbean islands of Trinidad, Cuba and Jamaica, Capomo nuts are hand gathered from the forest floor by local indigenous women. While sun-drying on the roof for 3 weeks, Maya Nut Producers walk on them to crush the hard outer layer. Next, our coffee roaster roasts the dry, crushed nuts, yielding bold and complex layers of coffee-flavor with notes of cinnamon and chocolate. Here at Tattva’s, we enjoy this delicious drink all through the day. In the morning, we brew Capomo with coffee, adding a heaping serving of nutrients to a reduced serving of caffeine. After lunch, Capomo brew both enlivens and relaxes the afternoon work load. And what a treat to enjoy a steaming hot cup of “coffee” after dinner! Our slow-roasted Capomo tastes most shockingly like that beloved morning pick-me-up when simmered on the stovetop for 10 to 40 minutes, according to desired strength. You can also brew Capomo in a traditional drip coffee maker, percolator, or any way you choose. Add your choice of milk and sweetener or drink it straight up black like a Mighty Sailor ~ a 40 minute simmer will surely put hair on your chest! While this super food does not contain a single drop of caffeine, it does contain tryptophan, a naturally occurring amino acid that aids in both relaxation and a sense of well-being. In stark contrast to caffeine, it is not stimulating to the central nervous system, so there are no jitters and no crashes. As a superfood, Capomo serves to build health and energy levels naturally over time, so the more you drink it, the better you feel. It is one of the richest plant sources of amino acids and protein and also high in fiber, potassium, iron, zinc, vitamins A, B, C and E. Calcium and magnesium are perfectly balanced in the Capomo nut, making it an easy to absorb food source of these integral minerals. The Maya Nut t ree was the staple food to indigenous peoples all through its habitat, but over past years has fallen out of recognition. The Maya Nut Institute, a non-profit public charity devoted to “find balance between people, food and forest,” exists to bring knowledge of this bounty back to the people. Since their 2001 inception, more than 600 rural and indigenous women have established 25 fully autonomous Maya Nut businesses with a strong emphasis on both education and re-forestation. The Maya Nut Institute’s reforestation partners have planted over 2,000,000 trees in Haiti, Columbia, Guatemala, Peru, Honduras, Nicaragua, and Mexico. So why would an entire non-profit organization devote all its work to a single species of tree? The Maya Nut tree compels humans in many ways, but most notably, one Maya Nut tree can produce as much as 800 pounds of food in a given year, and live to over 100 years. Though native to the rain forests, it thrives in a wide range of ecosystems, making it an important climate-change resistant food source. The fruit is eaten by avian and mammalian animals, the seeds used by people for both food and medicine; even the leaves can be steamed and eaten like spinach! And as you all know, he’s strong to the finish ‘cause he eats his spinach, he’s Popeye the Sailor Man! Click Here to try a bag of this delicious drink today!